ICE arresting a suspected gang member. Successful project: 1,133 arrested, $70,000 and 20 kilos of narcotics seized. Mexico is supported by the United States in this conflict through the Mérida Initiative. Project Shadowfire was an American police investigation in early 2016 that resulted in the arrest of 1,133 people, 915 of whom are suspected members of "multinational organized criminal gangs", involved in murder, racketeering, drug smuggling and human trafficking from Mexico and elsewhere. The majority of the arrests took place in Los Angeles and San Francisco in California; El Paso and Houston, Texas; Atlanta, Georgia, and San Juan, Puerto Rico. More than twenty kilos of narcotics, about $70,000, and 150 firearms were also seized. Of the 1,133 arrested, 1,001 were charged with criminal offenses, and 132 were arrested for immigration violations. Over 900 of those arrested are believed to be members or associates of MS-13, Sureños, Norteños, Bloods and other prison gangs. U.S. Immigration and Customs Enforcement (ICE) officials confirmed that most of those arrested are American citizens, though 239 are foreign nationals from Central America, the Caribbean, Asia and Europe. According to Peter Edge of Homeland Security Investigations in an interview with ABC News: "What we are seeing is that the gangs are becoming a little bit more organized as gang members enter the United States, whether it’s legally or illegally, and they're doing a wide variety of recruiting... Our hope [is] that these criminal gang members will be processed through the judicial system, and that we will be ultimately able to deport those who are not citizens of this country." Former ICE Director Sarah R. Saldaña released the following statement concerning Project Shadowfire: "This operation is the latest example of ICE's ongoing efforts, begun more than a decade ago under Operation Community Shield, to target violent gang members and their associates, to eradicate the violence they inflict upon our communities and to stop the cash flow to transnational organized crime groups operating overseas." 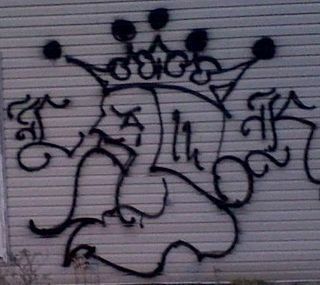 ^ a b c d "More than 1,100 arrested in ICE operation targeting MS-13, other gangs". Fox News Latino. 2016-03-28. Retrieved 2016-03-31. ^ a b "ICE arrests more than 1,100 in operation targeting gangs". US. Immigration & Customs Enforcement. 2016-03-28. Retrieved 2016-03-31. The United States Immigration and Naturalization Service (INS) was an agency of the U.S. Department of Labor from 1933 to 1940 and the U.S. Department of Justice from 1940 to 2003. Police and Judicial Co-operation in Criminal Matters (PJCC) was the third of the three pillars of the European Union (EU). It was named Justice and Home Affairs (JHA) before 1999. The pillar existed between 1993 and 2009, when it was absorbed into a consolidated European Union structure and became the area of freedom, security and justice. 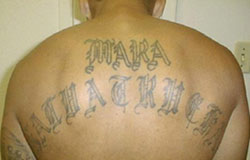 Mara Salvatrucha, popularly known as MS-13, is an international criminal gang that originated in Los Angeles, California, in the 1970s and 1980s. 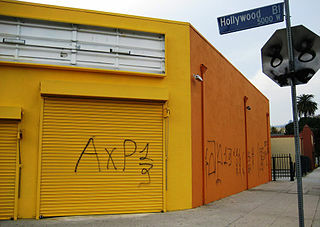 Originally, the gang was set up to protect Salvadoran immigrants from other gangs in the Los Angeles area. Over time, the gang grew into a more traditional criminal organization. MS-13 is defined by its cruelty, and its rivalry with the 18th Street Gang. Project Wildfire was a nationwide, multi-agency investigation of various transnational criminal gangs in 2015 that resulted in the arrests of 976 individuals, representing 239 different organizations, in 282 cities in the United States mainland and Puerto Rico. Eighty-two firearms, 5.2 kilograms of methamphetamine, 7.8 kilograms of marijuana, 5.6 kilograms of cocaine, 1.5 kilograms of heroin, $379,399, counterfeit merchandise with a suggested retail price of $547,534 and five vehicles were also seized. James A. "Jim" Dinkins is an American law enforcement officer and business executive who was the first head of Homeland Security Investigations for US Immigration and Customs Enforcement, serving in that role from 2010 to 2014. He is currently senior vice president and director of operations of Enterprise Financial Crimes Compliance for US Bank. Operation Devil Horns was a four-year-long criminal investigation run by Homeland Security Investigations (HSI), culminating in the arrests and convictions of more than three dozen members of the MS-13 gang in San Francisco. It is one of the largest such cases of its kind in U.S. history. On February 3, 2019, members of the drug gang MS-13 murdered a member of the 18th Street gang on a New York City Subway platform in Queens. The confrontation began at one station, continued on a 7 train, and spilled out of the train onto the platform of the 90th Street–Elmhurst Avenue station, where a bystander recorded the killing in front of many subway riders.